Apple has updated its flagship iPhone X handset with two more powerful models, one of which is larger than before. 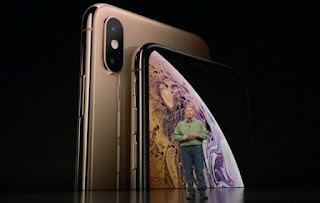 The iPhone XS Max has a 6.5in (16.5cm) display. The iPhone XS has the same 5.8in-sized component as the original. Apple said that its Face ID system now works faster than before, and is still unveiling other features. There had been concerns that the relatively high £999 entry price of iPhone X would limit its appeal when it was announced a year ago. But Apple said it had consistently proven more popular than either of the lower-priced iPhone 8 models. Market research firms suggest it also outsold rival companies' flagship devices. That helped propel Apple to become the world's first company with a market capitalisation above $1tn (£768m). However, China's Huawei still managed to overtake it in terms of overall smartphone market share in the April-to-June quarter, putting Apple into third place. "Huawei was able to overtake it because Apple is not playing in the mid and low ends of the market," commented Francisco Jeronimo from IDC. "But Apple is very well positioned in the premium segment, and we don't expect that to change over the next 18 months."